Ground fl. - 2/3 people. 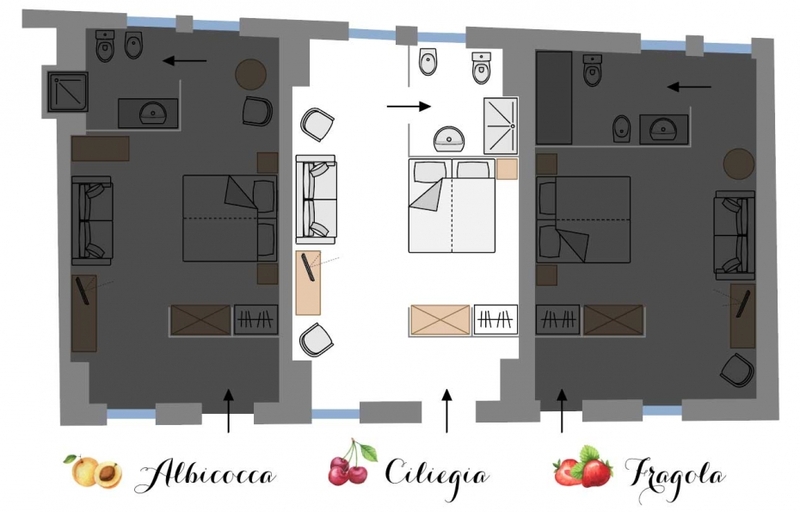 At the ground floor, with direct access from outside, in a central position, facing roses bed and swimming pool, it is a wide room with two beds (separate 85x200 or to be combined in a king size bed 170x200) and a sofa to be transformed into a third bed (80x190). One window turns to south, on the court's side, in front of the pool, whilst the second one turns to morning side. The wide spaces and the large doors of 85 cm allow the accommodation of handicapped people. Also the bathroom, with a window, has been studied for helping people moving with difficulties, being easily accessible for persons that use a wheelchair. The wide shower is at the floor level, without any step.